"On the eastern side of the Sierras, the winds come down the slopes into the valleys with great force and it seems at times it's almost constant. This tree is actually a cottonwood that has been topped by years of those winds. 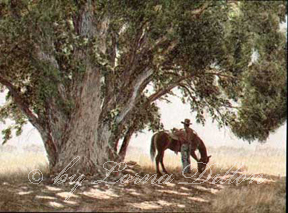 While it's a strange shape for a cottonwood, it's perfect for a break from the intense midday sun."